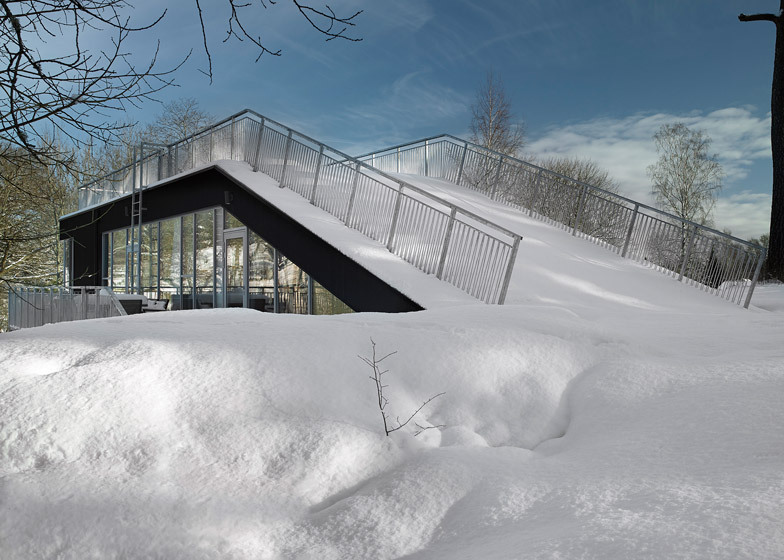 The roof of this Stockholm house by Streetmonkey Architects turns into a ramp for children to sled on when it snows (+ slideshow). 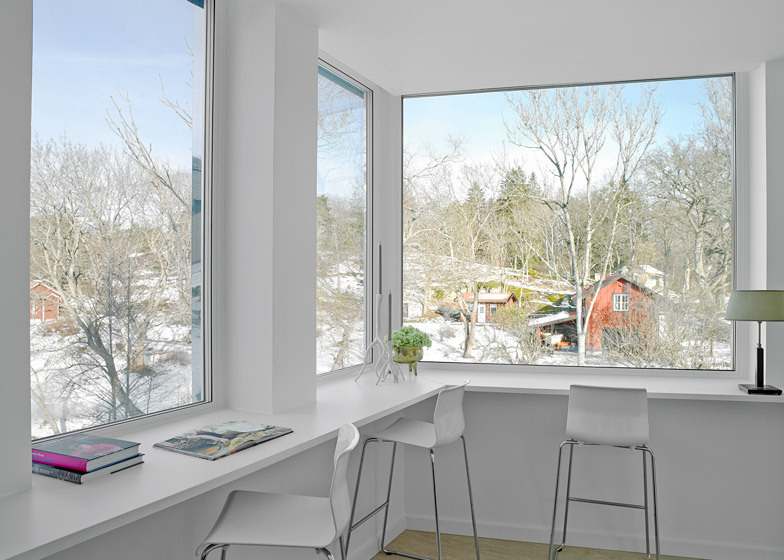 The two-storey residence is located on a rural site in Värmdö, an island in the centre of the Stockholm archipelago. 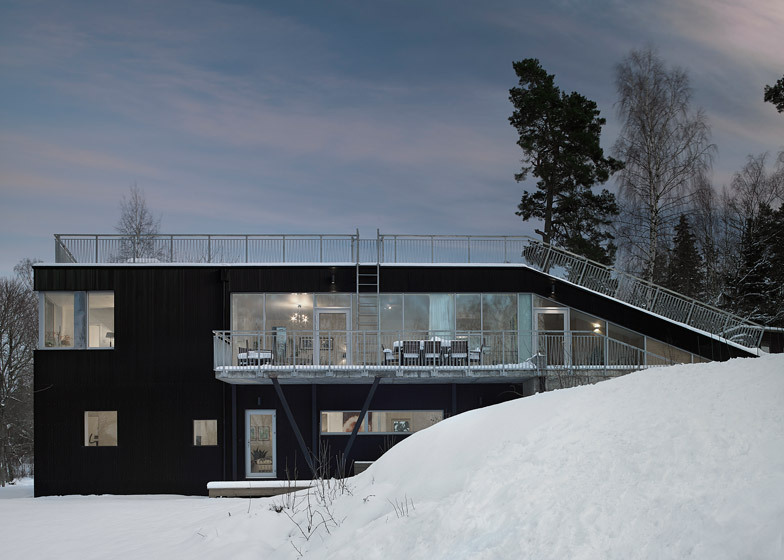 Because of its scenic surroundings, Swedish studio Streetmonkey Architects decided to give the house a slanted profile to lessen its visual impact on the landscape. As the tail end of the building is slightly sunken into the hillside, the roof slopes all the way down to meet the ground. This prompted the idea of repurposing the roof as a large terrace and sledding area. 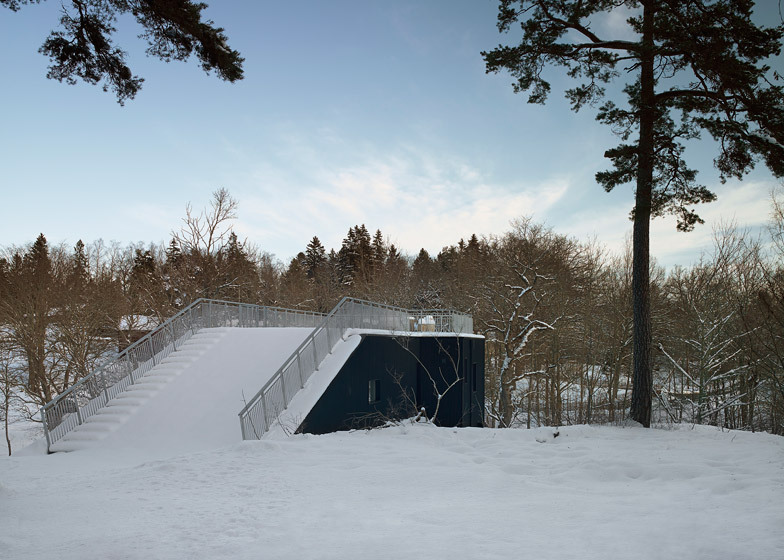 "The sledding ramp was my idea," explained architect Cage Copher. "It is primarily a device to camouflage the building, because it is so close to neighbouring houses, but it also makes the roof usable." "The kids who live nearby seem to be making the most of it!" 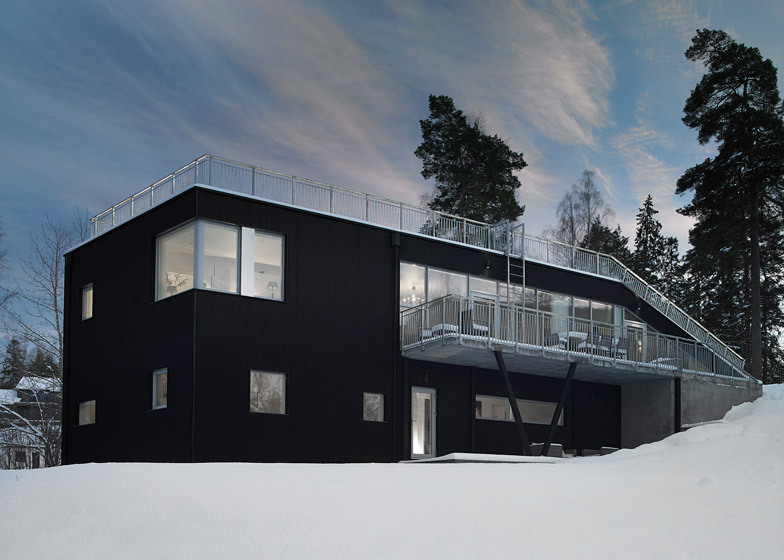 The feature gave the project its name, Pulkabacken, which is the Swedish word for a sledding hill. The roof also becomes useful during the sunnier summer months. Stairs running up one side of the grass-covered slope lead to the hard flat terrace on top, which Copher describes as a party deck. "The idea was to create a vacation lifestyle for year-round living," Copher told Dezeen. 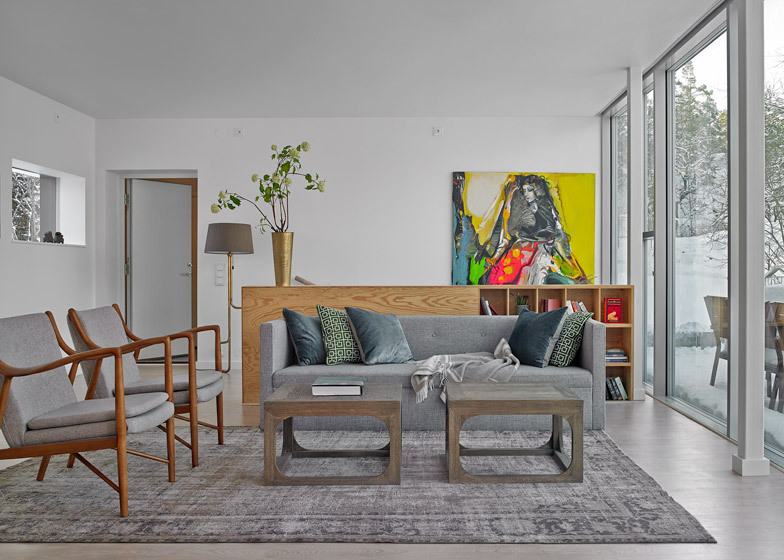 "The house is in an area typically used for summer houses, but it is becoming more and more popular to live there full time." The building has an overall area of 200 square metres, organised over two storeys. 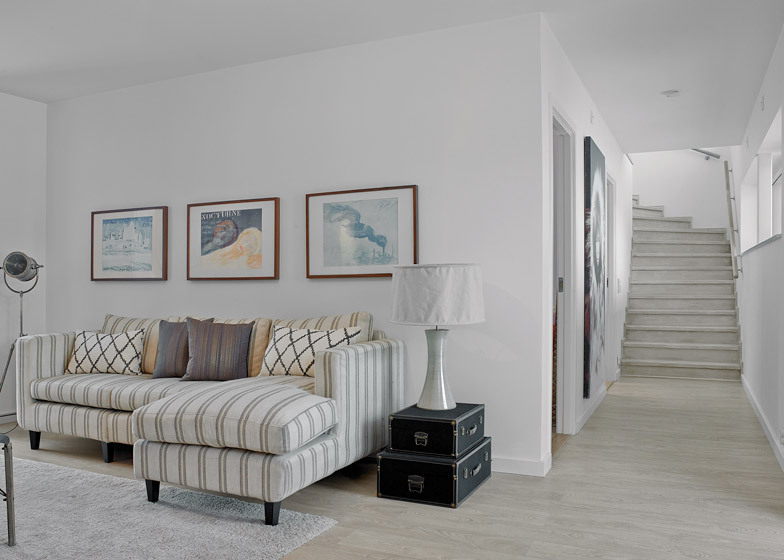 The main living and dining spaces occupy the upper level, along with a study, leaving enough space on the ground floor for a series of bedrooms and a flexible family room. "We wanted the house to sleep as many people as possible," said Copher. "In the summer, the population of this area doubles and children migrate in packs from house to house. One night you could end up with all of your friends' children sleeping over, so the bedrooms are large and many." "We also designed the stairs to be large and open to accommodate many children running up and down," he added. The main entrance is positioned on the northern facade, where a raised platform forms a sheltered outdoor seating area. This is mirrored by a balcony above, which extends the living room outdoors. 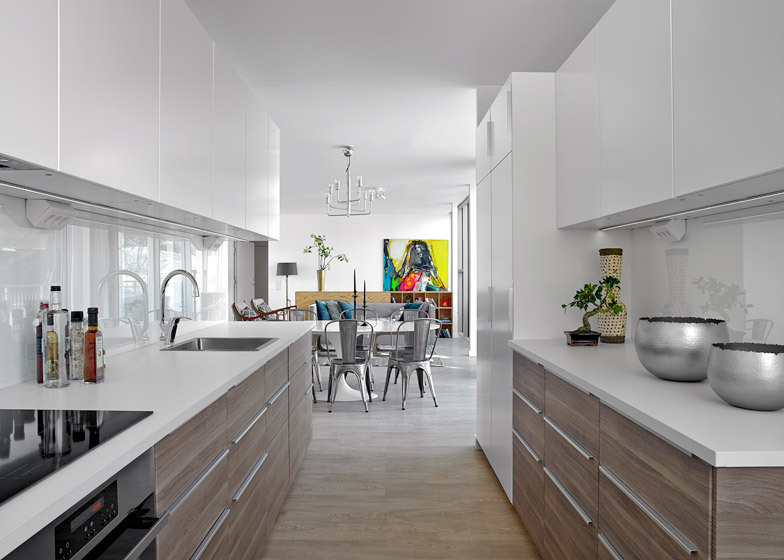 The house was built using a modular construction system, which was customised to suit the sloping roofline. This allows the building to support the weight of heavy loads of snow. 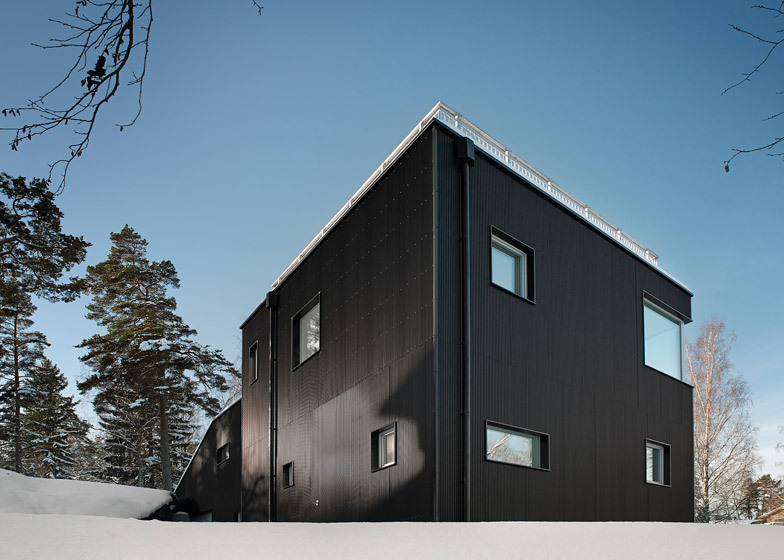 Walls were clad with black corrugated steel panels. 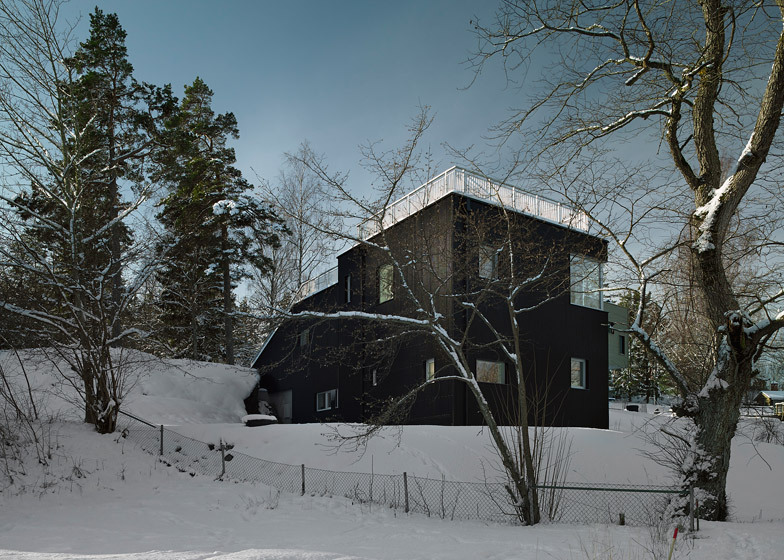 "Black was chosen because it is beautiful both in the snow and with the green of the forest," added the architect. 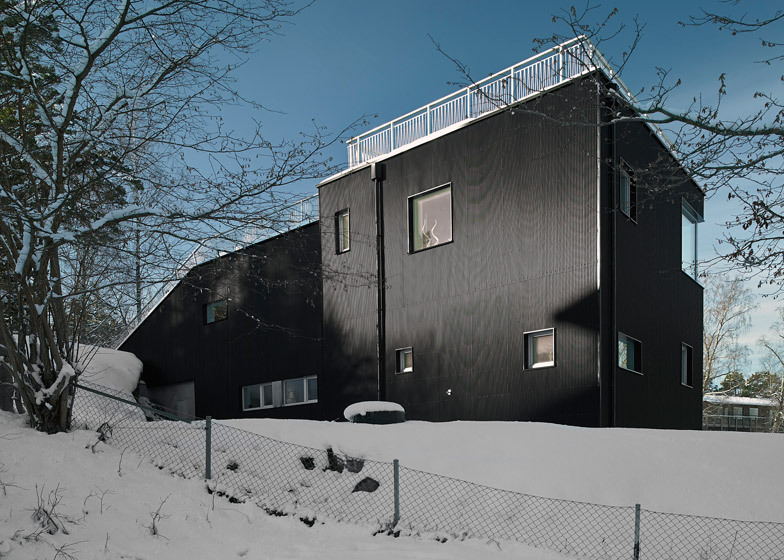 "Dark houses blend discreetly with the forest while lighter houses pop out."